More photos, and a complete artist statement can be found in the 2018 Senior Exhibit Gallery. More photos of installation of The Lost Man’s Fortune can be found in the 2017 Senior Exhibit Gallery. 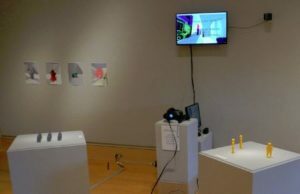 More selections from the installation, Innovating a Legacy can be found in the 2018 Senior Exhibit Gallery. More photos of the installation can be found in the 2017 Senior Exhibit Gallery. 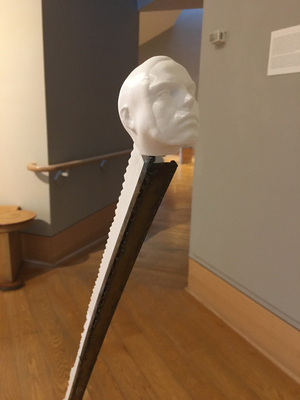 Speaking of these many student shows in the Wriston Galleries, gallery curators uses the makerspace’s Silhouette Cameo electronic cutter to create titles for their exhibits. It saves a great deal of money compared to requesting to have them made by an outside sign shop. 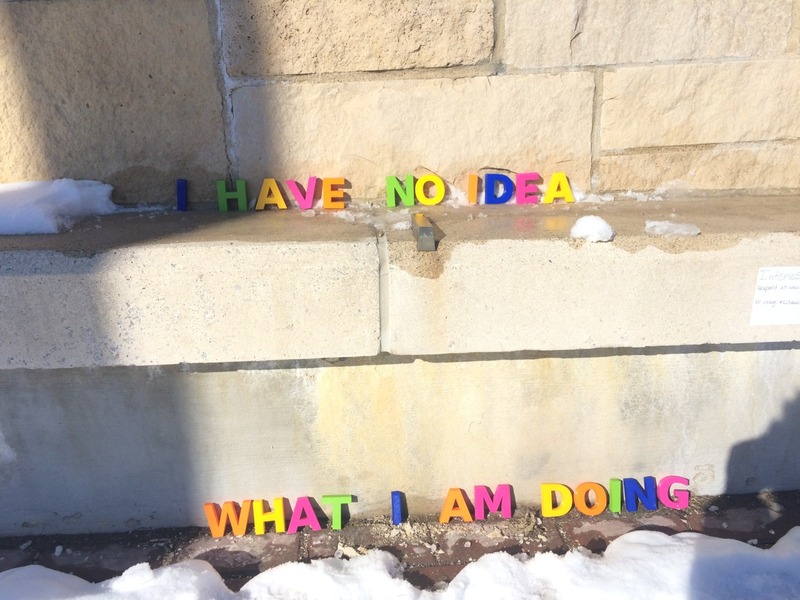 Sara Morrison ’18 created a series of word art that she displayed around campus for her New Media in Art assignment. She used the 3D printer and electronic cutter to create letters from PLA filament and vinyl. Sara encouraged members of the Lawrence University community to take photos of the word art (as she left it, and as it had been changed by others) and post them to her Tumblr page, LU Word Art. Malcolm Lunn-Craft ’17 used the electronic cutter to create stencils for his painting class. The adhesive vinyl helped with his assignment medium of spray paint. While not created in the makerspace, Malcolm’s powerful photographs from his senior exhibit are available to view in the 2017 Senior Exhibit Gallery (content warning: visual allusion to violence). 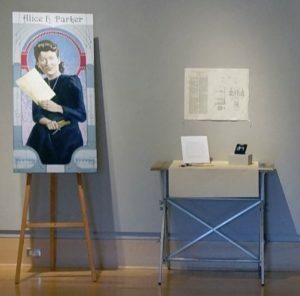 See more uses of the makerspace by Studio Art students and faculty on our Makerspace Assignments at LU page, as well as on our Instagram and Twitter. 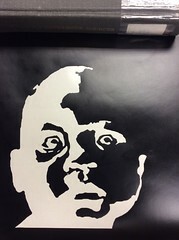 This entry was posted in 3D Printing, AR/VR Technology, Art, Vinyl Cutter, Virtual Reality and tagged 3D Printing, 8-bit art, academic library makerspace, African American women inventors, iPad in education, makerspaces and art, senior capstone, senior exhibition, silhouette cameo, Virtual Reality, VR in education on August 3, 2018 by Angela Vanden Elzen. Students experiencing the VR video. In this immersive VR film by Contrast VR and AJ+, ride with Jamalida around the crowded camp, accompany her inside her tiny home, sit down in the narrow streets with her sons as they play and feel what’s it like to be a refugee stranded in a foreign land. Prior to coming to the makerspace, students were instructed to download the Vimeo app on their smartphones. Additional smartphones were provided in case students did not have their own. Cardboard VR headsets provided a low-cost, and low-tech way to allow students to immerse themselves in a new surrounding and feel what daily life is like for people living in refugee camps. While watching the video, students could use audio headsets to block out other sounds and listen at a comfortable volume. They could move through the space and rotate to explore the camp. The VR experience allowed students to immerse themselves much more than passively watching a video. Immersive VR videos like I Am Rohingya give students an opportunity to experience powerful stories, and at between $8-$15, cardboard VR headsets offer a cost-effective way to do this. 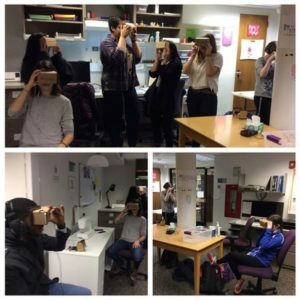 This entry was posted in Anthropology, AR/VR Technology, Assignments, Virtual Reality and tagged academic library makerspace, Google Cardboard, Virtual Reality, VR in education on April 23, 2018 by Angela Vanden Elzen.